While bulldozers and diggers bashed a 50-foor-wide path for the Keystone XL pipeline south, planned from Cushing, Oklahoma to Port Arthur, Texas, a group of tar sands blockaders have taken to the trees. As tar sands oil resumed flowing through the 2,100-mile Keystone pipeline carrying 590,000 barrels of crude per day from Canada to facilities in the Midwest, the tree-sit construction blockade of the $7 billion Keystone XL in East Texas has persisted over a month. Keystone 1 was recently shut down by TransCanada for safety issues along the portion between Missouri and Illinois. 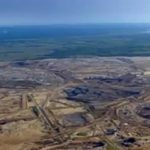 A source of numerous spills of toxic diluted-bitumen crude oil since its construction five years ago, protesters make their claims clear: mining, transporting and burning tar sands oil puts land and water resources, and our climate stability, at risk. Although the permit for the northern leg of the Keystone XL pipeline is still under consideration by the State Department, the southern leg of the pipeline, slated to carry 1.1 billion barrels of corrosive tar sands oil, has won the support of President Obama, obtained permits from the Army Corps of Engineers and turned back challenges in Texas courts. The Keystone XL pipeline is slated to carry 1.1 billion barrels of toxic tar sands oil to refineries on the Texas Gulf Coast to be exported to the world. While bulldozers and diggers bashed a 50-foor-wide path for the pipeline, planned from Cushing, Oklahoma to Port Arthur, Texas, a small group of blockaders have taken to the trees. On September 24, eight activists climbed into 80-foot oak and pine trees and refused to come down until the tar sands pipeline was stopped for good. Two blockaders remain as the others have been arrested or escaped to help organize the growing campaign across the region. During the last month, TransCanada has tried everything to deter the blockaders from stopping the project. They’ve encouraged police to use torture tactics, operated heavy machinery dangerously close to peaceful protesters, confiscated cameras, hit them with a SLAPP law suit, hired local law enforcement to set up a police state around the blockade, denied protesters food and water, arrested journalists, and subjected blockades to 24/7 surveillance and floodlights. Eleanor Fairchild, a great-grandmother, has been staunchly opposed to TransCanada’s Keystone XL tar sands pipeline project since she was first informed that it will permanently bisect her 300 acre ranch many years ago. She never signed a contract with the Canadian pipeline company, who, in turn, proceeded to expropriate her ranch through Texas’ lax eminent domain legal proceedings. Violated by TransCanada, all but abandoned by elected officials, and legally unrepresented, Mrs. Fairchild took action by other means during last year’s Tar Sands Action protests at the White House, which resulted in 1,253 arrests during the two week long civil disobedience. Daryl Hannah and Eleanor Fairchild were arrested for trespassing in protest against construction of the Keystone XL pipeline across Fairchild’s ranch in East Texas. 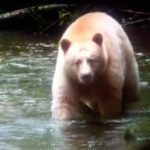 In October, she and actor-environmental-activist Daryl Hannah marched across Fairchild Farms to block bulldozers from continuing to clear large swaths of Mrs. Fairchild’s land along the toxic tar sands pipeline route. Both women were taken to the Wood County Jail on criminal trespassing charges and released, according to jail records. Mrs. Fairchild charged with trespassing on her own land. Ms. Hannah also faces resisting arrest charges. Gulf Coast mother chains herself to a Keystone XL pipeyard gate in Texas showing solidarity with the risks to the Gulf from transporting tar sands oil. 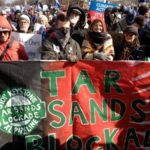 Meanwhile, 3,500-strong join Northern Gateway Pipeline Protest in BC, Canada: Thousands of protesters who packed the front lawn of the British Columbia legislature yelled a thunderous “Yes” when asked if they were willing to lay down in front of tar sands pipeline bulldozers if the Enbridge Northern Gateway project is approved. Fifty protesters converged to resupply the tree-sit near Winnsboro, Texas recently, facing significant oppression from police and security. From www.tarsandsblockade.org.